Ottawa – At a ceremony held today, Mayor Jim Watson and The Honourable Catherine McKenna, Minister of Environment and Climate Change, on behalf of The Honourable Mélanie Joly, Minister of Canadian Heritage, with Councillor Tim Tierney, Chair of the Ottawa Public Library Board, dedicated the future home of a joint facility shared by the Ottawa Public Library and Library and Archives Canada. Dignitaries unveiled a sign designating the site at the corner of Albert Street and Commissioner Street. 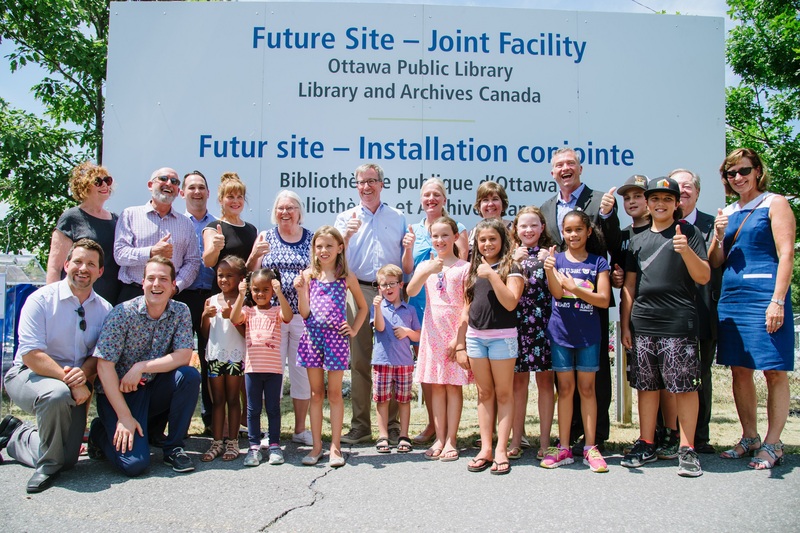 In 2017, City Council and the Ottawa Public Library Board approved partnering with Library and Archives Canada to build a new joint facility, which will serve as a national institution, a city-wide resource, and a community gathering space. Located at the eastern edge of LeBreton Flats, the new facility will be located near homes and businesses, as well as green spaces, including the Garden of the Provinces. In addition, light rail will figure prominently into access to this new facility, as Pimisi Station is less than 300 metres away. Pedestrian access will be improved with planned road and intersection modifications along the Albert and Slater corridor. These will facilitate movement and support integration with the Central Business District and residential neighbourhoods to the east and south. This unique partnership will provide the Ottawa Public Library and Library and Archives Canada with a unique, state-of-the-art facility that brings together the creative services of a public library and the public services of a national library and archives for a richer customer experience. Expected to open in 2024, this new facility will be a modern, iconic building and destination that will be designed by a renowned architectural team working with the City and the public on the look, feel and user experience of the building.